During its heyday, when it served as the residence for princes of the French royal blood from the Rohan family, the originally Baroque Sychrov castle was expanded and rebuilt in Neo-Gothic style. Leading Czech artisans and artists (such as the carver Petr Bušek, the glass painter Jan Zachariáš Quast,etc) together with the architect Bernard Grueber and Josef Pruvot, modified the castle to the taste of Prince Kamil de Rohan to its Historicist form, The new English landscape park became a model for important arboreta such as Průhonice and Konopiště. Sychrov offers a comprehensive look at the lifestyle of the high aristocracy in the second half of the 19th century. The main tour route features the spaces on the first floor of the main castle building with the private family rooms (Prince and Princesse’s suite), the luxurious Royal Suite for the most important guests, the state areas (hall stairs, drawing room library, billiard room and large dining room) and the castle chapel. The history of the place where the chateau now stands dates back to the 15th century. At that time, a fort was standing there, owned by the Bohemian royal chamber. 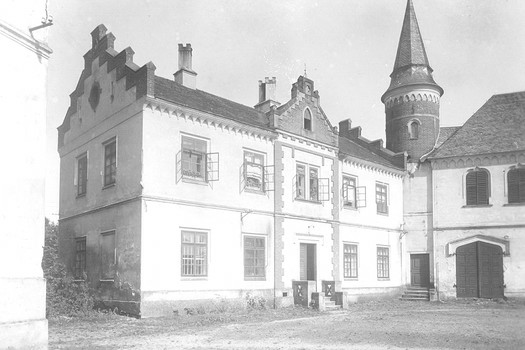 It was replaced by a manor in the 16th century, and then by a small Baroque chateau built between 1690 and 1693 by the knight house of Lamotte de Frintropp. The members of this French aristocratic house were army officers fighting for the Austrian emperor during the Thirty Years War, and then rewarded by property confiscated from the Bohemian aristocracy. 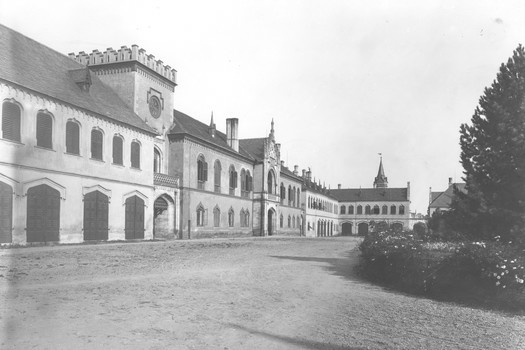 In 1740, the domain was bought by Francis of Wallenstein, from the Mnichovo Hradiště line. 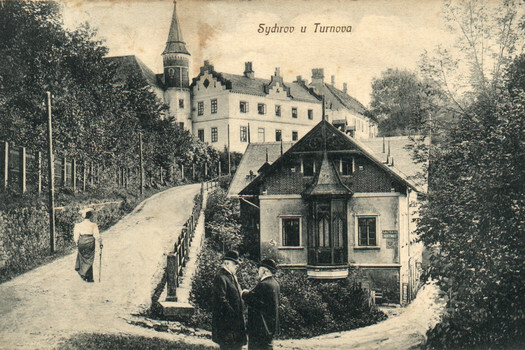 As the Wallenstein house settled down in Mnichovo Hradiště, the chateau of Sychrov was no more a place of continuous residence for the aristocracy. For almost eighty years, there were no significant changes, and the building was primarily used for technical and operational purposes and for the accommodation of the service staff. 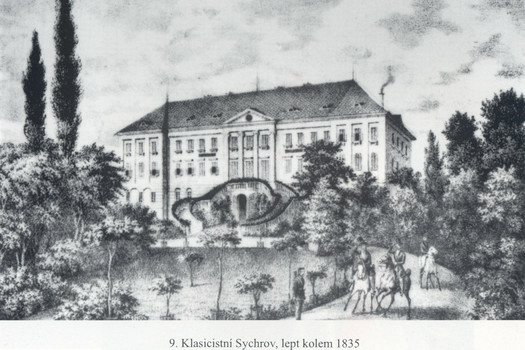 This situation changed suddenly on August 30, 1820, as Sychrov (and the nearby Svijany domain) was taken over by Duke Charles Alain Gabriel Rohan. This was the start of the 125-year era of the Rohan House at Sychrov, and the best times of the chateau. The Rohan House originally came from Brittany; the first mention of it dates as far back as 951. During the centuries, their position was strengthening gradually, to become one of the ten most influential aristocratic houses of France; as direct cousins to French kings, they even gained the title of princes of the royal blood. The house consisted of several lines, their members held important public offices – military, political and religious. After the French Revolution, they left France for the Austrian monarchy. Unlike other aristocratic refugees who returned to France (during Napoleon’s reign, and especially during the Bourbon Restoration – i.e. under Louis XVIII and Charles X), the Rohans remained in Bohemia, even though they were encouraged to return. The main seat of the house was Sychrov, but as a decayed Baroque chateau, it didn’t really meet the requirements for the residence of dukes and counts. The first owner, Count Charles Alain Gabriel Rohan, started the spectacular empire-style reconstruction (finished in 1834). The building continued in the era of Duke Camille Joseph Idesbald Philip Rohan, when the current neo-Gothic style was created. 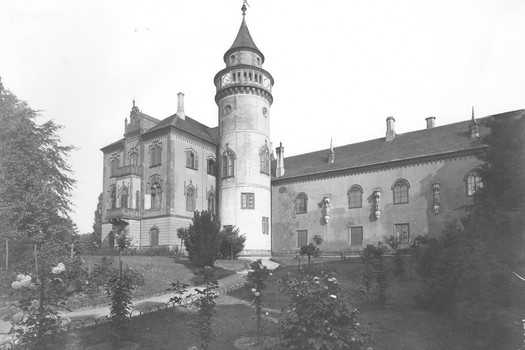 The romantic neo-Gothic reconstruction was carried out between 1847 and 1862, based on the project design made by Bernard Grueber, Professor of the Academy of Fine Arts, made Sychrov one of the most important heritage sites of the historicizing styles of the 19th century (such as Hluboká nad Vltavou, Hrádek u Nechanic, Lednice, etc.). All the works were done by Czech artists and craftsmen. The most important of them was Petr Bušek, a woodcarver who used his unique creative talent to give all indoor areas high artistic value, and unique atmosphere. Also important were the efforts of numerous other artists and artisans (sculptors Emanuel Max and Vincenc Smolík, upholsterer Ludvík Grein, cabinetmaker Petr König, blacksmith Jan Novák, etc.). 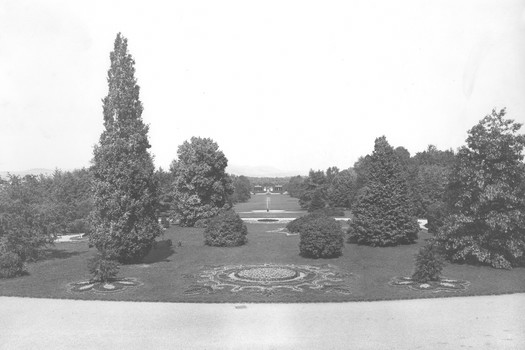 Duke Camille Rohan also paid great attention to the chateau park in the English style; the park truly flourished under Count Rohan, and became a model for many important arboretums such as Průhonice or Konopiště. In this era, rare harmony was achieved of the exterior of the chateau, the indoor space and the park. The end of the 1920s and start of the 1930s brought a functionalist renovation that partially changed the exterior of the building (removing various decorative neo-Gothic alcoves and attics, as well as plaster from the towers that was replaced by masonry), but also the indoor areas. In many rooms, Bušek’s woodcarving decorations were removed (such as the ceiling in the staircase hall), and the neo-Gothic equipment was replaced by modern items. After WW2, the chateau was confiscated based on the Decree No. 12/1945 Coll., and became property of the government. First it was used as the collection point of confiscated possessions, and since May 1, 1950, limited public access was enabled. During the 1970s, the access was extended to the eastern wing and the corridor of the southern part with Antonín Dvořák Memorial. Since the early 1990s, large reconstruction and restoration of the exterior, indoor areas and the park has been done; the aim is to restore the Sychrov Chateau to the design of the golden era, i.e. the second half of the 19th century.